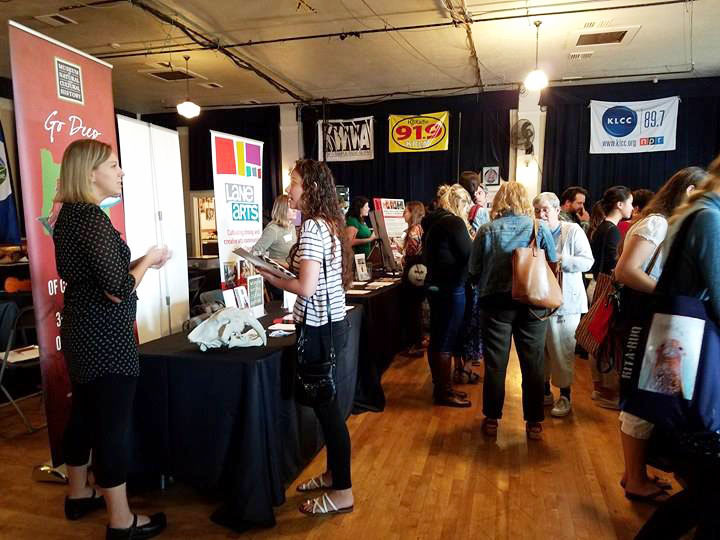 The Arts & Administration program’s annual 2016 Practicum Fair and Community Partner Reception took place this past Thursday, September 22nd at the historic WOW Hall. Each year arts and culture organizations from Eugene and Springfield congregate to share their organizations and passions with our incoming and returning students. We are very grateful that our city hosts so many exceptional professional development opportunities for our students to become involved with their community and deepen their academic experience at the University of Oregon. With help from the student organizations within the Arts & Administration Program, Emerging Leaders in the Arts Network (ELAN) and the Student Advisory Group (SAG), we were able to welcome 18 community partners at this year’s Practicum Fair! Practicums are a great opportunity for our students to get hands-on experience in a structured environment to refine their current skills and learn about the field of Arts Management through partner organizations. We would also like to thank our local businesses for continuing their support of our students and the arts in Eugene by donating raffle items that were given away during the 2016 Practicum Fair and Community Partners Reception. These items included exhibition catalogues from the Jordan Schnitzer Museum of Art, free admission to upcoming shows at the WOW Hall, and gift certificates from Red Wagon Creamery, Starbucks, Falling Sky Brewery, and Coldfire Brewing. For more information about practicums or to consider a practicum position in your organization, please visit our AAD Practicum Blog.